Learn how to plan and manage Application Lifecycle Management (ALM) in Microsoft SharePoint 2010 projects by using Microsoft Visual Studio 2010 and Microsoft SharePoint Designer 2010. Also learn what to consider when setting up team development environments, establishing upgrade management processes, and creating a standard SharePoint development model. Key considerations when establishing ALM processes include not only the development and testing practices that you use before the initial deployment of a single customization, but also the processes that you must implement to manage updates and integrate customizations and custom functionality on an existing farm. This article discusses the capabilities and tools that you can use when implementing an ALM process on a SharePoint farm, and also specific concerns and things to consider when you create and hone your ALM process for SharePoint development. This article assumes that each development team will develop a unique ALM process that fits its specific size and needs, so its guidance is necessarily broad. However, it also assumes that regardless of the size of your team and the specific nature of your custom solutions, you will need to address similar sets of concerns and use capabilities and tools that are common to all SharePoint developers. The guidance in this article will help you as create a development model that exploits all the advantages of the SharePoint 2010 platform and addresses the needs of your organization. In larger projects, quality assurance (QA) personnel might use an additional build verification or user acceptance testing (UAT) farm to test and verify the builds in an environment that more closely resembles the production environment. Typically, a build verification farm has multiple servers to ensure that custom solutions are deployed correctly. 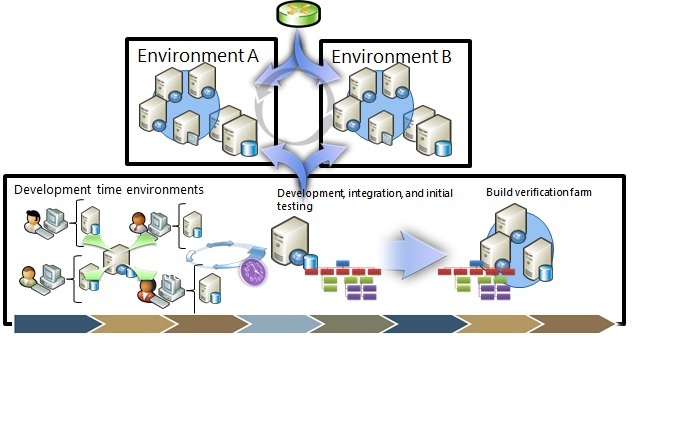 Figure 3 shows a potential model for relating development integration and testing environments, build verification farms, and production environments. 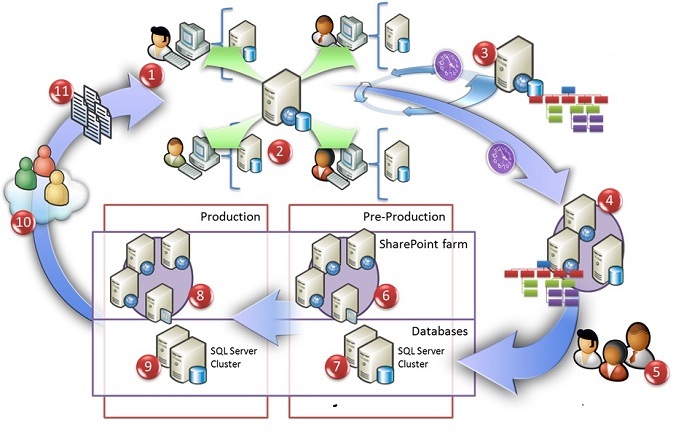 In this particular model, the pre-production or QA farm and the production farm switch places after each release. This model minimizes any downtime that is related to maintaining the environments. 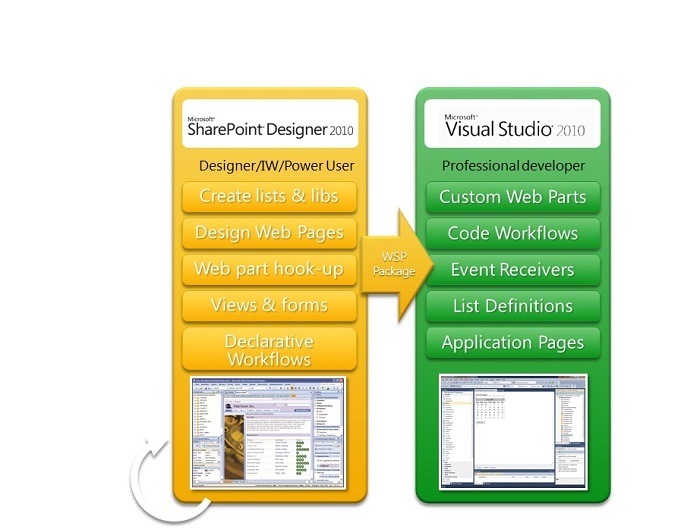 Another significant consideration in your ALM model is Microsoft SharePoint Designer 2010. 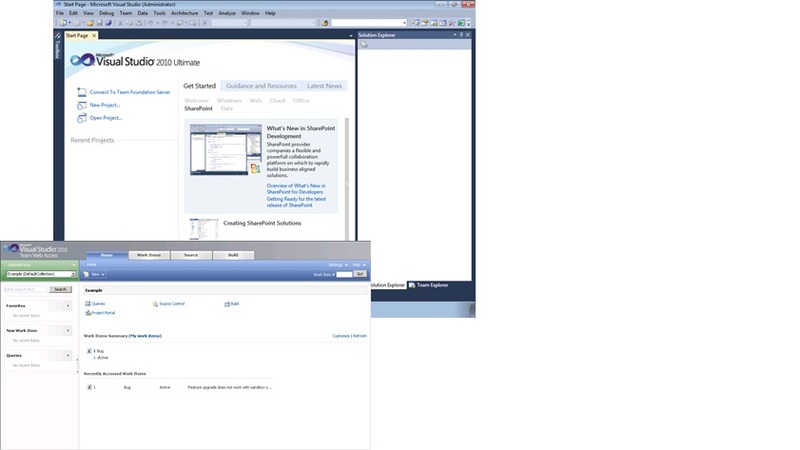 SharePoint 2010 is an excellent platform for no-code solutions, which can be created and then deployed directly to the production environment by using SharePoint Designer 2010. These customizations are stored in the content database and are not stored in your source code repository. General designer activities and how they interact with development activities are another consideration. Will you be creating page layouts directly within your production environment, or will you deploy them as part of your packaged solutions? There are advantages and disadvantages to both options. These settings are ignored if you use the farm administration account. 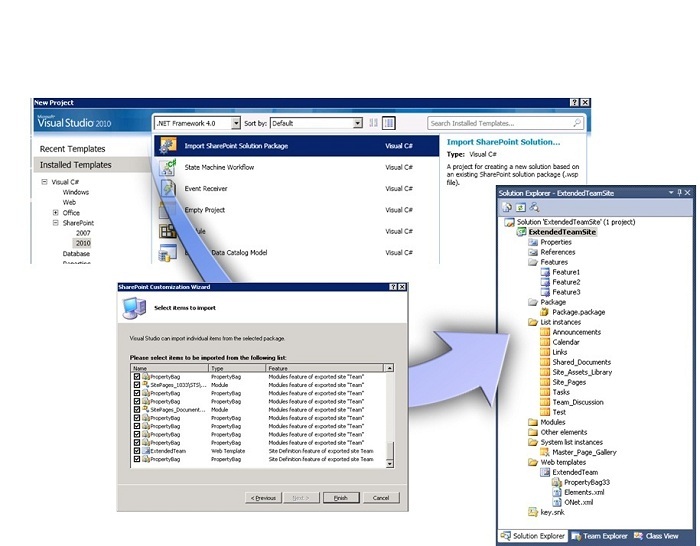 SharePoint 2010 must be installed on a development computer to take full advantage of its development capabilities. 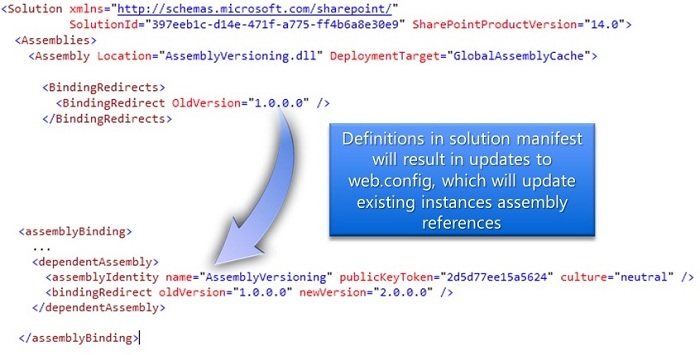 If you are developing only remote applications, such as solutions that use SharePoint web services, the client object model, or REST, you could potentially develop solutions on a computer where SharePoint 2010 is not installed. However, even in this case, your developers' productivity would suffer, because they would not be able to take advantage of the full debugging experience that comes with having SharePoint 2010 installed directly on the development computer. 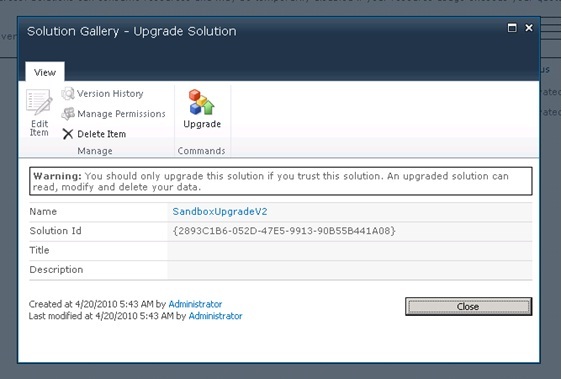 You can run SharePoint 2010 directly on your computer's client operating system. This option is available only when you use the 64-bit version of Windows 7, Windows Vista Service Pack 1, or Windows Vista Service Pack 2. You can use virtualization capabilities. If you choose this option, you have a choice of many options. But from an operational viewpoint, the option that is most likely the easiest to implement is a centralized virtualized environment that hosts each developer's individual development environment. The lack of centralized maintenance could hurt developer productivity in other ways. 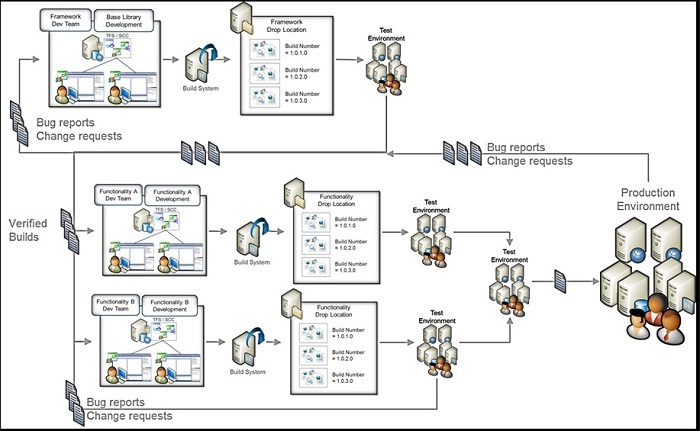 For example, this might be an unwieldy approach if your team is working on a large Microsoft SharePoint Online project that is developing custom solutions for multiple services (for example, the equivalents of http://intranet, http://mysite, http://teams, http://secure, http://search, http://partners, and http://www.internet.com) and deploying these solutions in multiple countries or regions. If you are developing on a computer that is running a client operating system in a corporate domain, each development computer would have its own name (and each local domain name would be different, such as http://dev 1 or http://dev2). If each developer is implementing custom functionalities for multiple services, you must use different port numbers to differentiate each service (for example, http://dev1 for http://intranet and http://dev1:81 for http://mysite). If all of your developers are using the same Visual Studio 2010 projects, the project debugging URL must be changed manually whenever a developer takes the latest version of a project from your source code repository. This would create a manual step that could hurt developer productivity, and it would also diminish the efficiency of any scripts that you have written for setting up development environments, because the individual environments are not standardized. Some form of centralization with virtualization is preferable for large enterprise development projects. 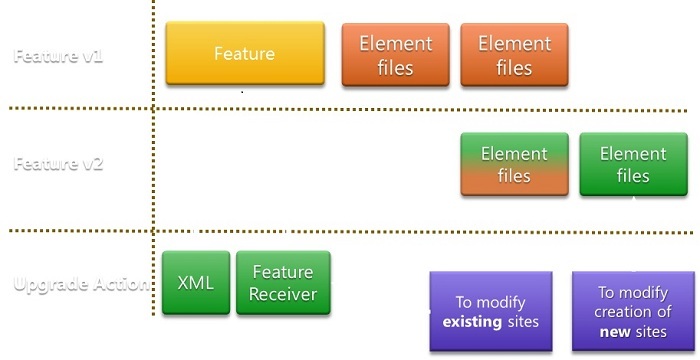 Upgrade actions are defined in the Feature.xml file. The SPFeatureReceiver class contains a FeatureUpgrading method, which you can use to define actions to perform during an upgrade. This method is called during feature upgrade when the feature's Feature.xml file contains one or more <CustomUpgradeAction> tags, as shown in the following example. /// Called when feature instance is upgraded for each of the custom upgrade actions in the Feature.xml file. The AddContentTypeField upgrade action can be used to define additional fields for an existing content type. It also provides the option of pushing these changes down to child instances, which is often the preferred behavior. When you initially deploy a content type to a site collection, a definition for it is created at the site collection level. If that content type is used in any subsite or list, a child instance of the content type is created. To ensure that every instance of the specific content type is updated, you must set the PushDown attribute to true, as shown in the following example.